Dan appeared on Good Morning America, Thursday, February 27th to discuss the latest on the mysterious death of Alfred Wright, who’s family is now suggesting foul play was involved. 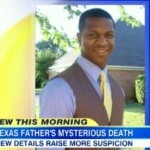 Wright was found dead after missing for 19 days in the small town of Jasper, Texas. Authorities ruled out a homicide saying it was a drug overdose but the family is refusing to believe that saying Wright did not do drugs. The police allegedly failed to properly investigate when Wright’s body was discovered in an “unnatural position” in the same wooded area police had claimed to have searched days earlier. The family has commissioned a second autopsy believing that when a 28 year old is found dead, unclothed in the woods there might be more to the story. Says Dan, “There are a lot of questions here about the relationship between the sheriff and various people involved in this story such that just for the sake of the appearance of propriety I think that the attorney general should have taken it over. Keep in mind you have him calling his wife saying ‘my truck broke down’, an hour later his parents come to pick him up at this convenience store, he’s not there. From day one they say the authorities say no foul play. They found his clothes, his I.D., his watch and yet the search was still called off just after four days, so there are a lot of questions to ask here.” Watch the full clip here.